Geoffrey Kimani is probably the first coach in Kenya to handle national teams in three sporting disciplines, namely football, rugby sevens and now athletics. 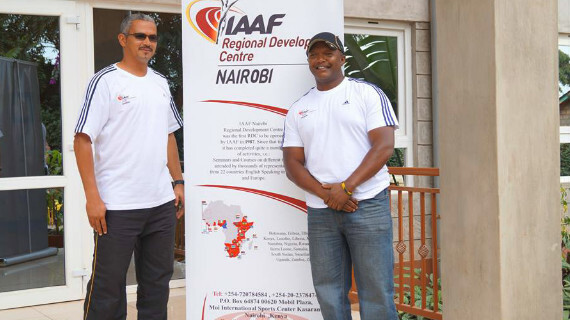 Michezo Afrika’s Michael Kwambo recently caught up with the decorated Sprint Coach who will be part of the coaching staff to the 2015 World Athletics Championships for a Q& A session. “Kim” as he is popularly refered to by those he has interacted with in the sports fraternity tells us what makes him tick, and also shares useful nuggets of advice for all and sundry, providing insights into his trail blazing exploits. My sports journey started just like any other kid growing in Nairobi in the eighties. Lots of space, playgrounds and long school holidays made for nothing but neighborhood competitions and rivalries…if it wasn’t soccer then it was ‘shake’ ,cricket, short sprint competitions etc. There wasn’t any early specializing in any sport so kids took part in sports based on what time of the school year it was… I took to soccer where I was a good goal keeper and track…the turning point was at the National Secondary School games in 1991 where I won the 100m dash. I never looked back from then and went on to represent Kenya in a number of meets over the same distance…the journey eventually took me to the US where running slowly took a back seat as I went into class to study. I was lucky to have had my internship at a chain of high performance centers in Atlanta (Velocity Sports Performance) under the mentorship of the legendary American Sprint Coach Loren Seagrave.. The experiences there were invaluable as we specialized in Speed and Power training for all sports....a typical day would see all kinds of professional athletes coming through the doors from NFL/NBA/NCCA/ prospects to Soccer/Lacrosse/ Baseball youth players. With the changing trends in sports where athletes are bigger and faster this kind of training became a necessity. I returned home in November 2007 where I started coaching the same, my first National team assignment was with Harambee Stars as a Speed Development coach under then coach Jacob Ghost Mulee. We played Nigeria here in Nairobi and settled for a draw with a largely local based playing unit. I have since gone on to become a World Rugby Educator in Strength and Conditioning,so the journey is now shifting to impacting the knowledge to coaches in class. 2. What attracted you to coaching? 3. How has the coaching journey been? I have had a smooth sailing journey so far with all the coaches that I have worked with, you see, I can only join/coach a team if the head coach see’s the need for my kind of expertise into his training philosophy. If for instance a soccer coach loves to play a fast passing game then it follows that his team must be well prepped for this kind of brand! In modern day sport, skill alone without good Strength/Speed/Power amounts to nothing. Defenses are getting meaner due to the physical presence of the ‘new’ athlete hence the offense needs to adapt and get faster and wittier…with this comes the need to address the three pillars of athleticism namely; Speed/Power/Agility so as to have a competitive team on all fronts. 4. You have been appointed as sprints coach for the national athletics team to the world championships, what's that feeling like? It was an emotional moment when I heard my name especially due to the fact that I never really featured for my country on any major games as an athlete. Getting the nod and confidence from the federation to handle Kenyan sprinters at the biggest track event in the world calendar is quite an honor. This however takes a back seat as the expectations from the athletes/Kenyans takes priority in the next 3 weeks of training. I have 8 sprinters taking part in various sprint races 200/400/400 hurdles and it’s my duty to help each and every one of them to perform at their optimum and attain their goals. Athletics is an individual event so save from handling the physical aspects of training i will be looked upon to guide them through their various running tactics and mental strength. 5. Where would you like to see Kenyan sprinters in the next few years? The current crop of sprinters have really done well to quell the false notion that we are only good in distance races…in the lead up to the nationals and trials we saw long standing national records falling, an indication that they can perform at the world stage if proper coaching methods are engrained early in the season. We’ve been medalling in the long sprints over the years but recently the short sprints have also started showing promise especially through the influence of the annual Bahamas relays. Kenya holds the African record in the 4x200m which is no mean feat. This is a good stepping stone to have them medalling in the coming years. 6. You are probably the first coach to handle Kenyan national sides in three different disciplines i.e rugby, soccer and athletics...your take on this? You are right about that, I think it’s a record of sorts handling 3 mational teams from different sports. I must hasten to add that it’s nothing too special nor does it make me extraordinary…I am just lucky to be a pioneer on matters Speed Conditioning. Results and failures in equal measure…Good results get me back into my books in search of even better training methods so as to dominate…Failures get me back into my training programs to see where things went/might be going wrong. I also take pride in watching young athletes progress into responsible adults and reliable employees in their respective places of work. It’s the reason we exist as coaches as what we are handling are not machines but humans, once we lose the human touch then things go wrong very fast. 8. Lastly, any advice to sportspeople and the public in general? If you choose the path of an elite sportsman then it follows that you must be guided by the following principles …Discipline, Hard work, Humility, Integrity, Recovery.. Be prepared to give up some luxuries in order to remain competitive. The public should also appreciate what it takes to make it to the top and understand that sports doesn’t necessarily mean winning on the field of play only…if it succeeds in transforming/rehabilitating an individual to a better Citizen/Father/Husband/Wife/Brother....then this should be applauded.